Serving raw meat is risky business. Please leave it to the professionals. 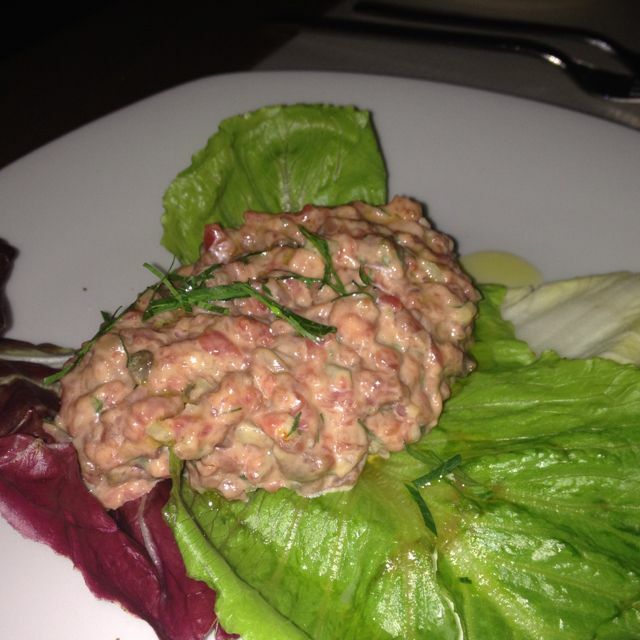 In the hands of a chef, steak tartare can be a truly beautiful thing. The process seems fairly straightforward: Obtain high quality beef, cut carefully into small pieces, season heavily, dress with a sauce or vinaigrette with balances flavors of salty and sour, then plate with the appropriate accoutrements (usually some kind of crunchy bread or potato product). When done right, it is cold and salty and gamey and has that perfectly tender texture that even the rarest cooked meat can never achieve. But, please understand: It is ACTUALLY VERY HARD TO MAKE. So, as much as you might enjoy ordering it at restaurants, please learn from the disgusting mistakes so many people have posted on the internet, and don't try this at home. People use pre-ground beef, which is wrong. It will get sticky and look like chewed-up mush and usually isn't fresh enough to eat raw. They take it right out the package and put it on a plate. Gross, lazy, and wrong. This could literally contain the unknown parts of 50 different cows. You think that beef is fresh enough? Raw meat should be red. Not brown. People put big chunks of onion, scallion, and garlic inside, as if they're making hamburger patties. They put an egg yolk on top, and don't separate it properly. Where is the fresh citrus juice? Why is this happening? Bad idea — not the point. ... or dress it so heavily that it is unrecognizable. Again, wrong, not the point. If someone does have the good sense to actually cut the beef, his knife probably isn't sharp enough. Ripping the meat apart with a dull blade is irresponsible and makes everyone sad. Go ahead, kids, spoon some raw beef onto your plate from the giant bowl in the middle of the table. Nothing about this seems that wrong. Probably not that bad, but the fact that this is plated like a giant beef flower is pretty wrong. ... please think twice before you try this at home. Hey mister, why is there a raw burger patty on your salad? 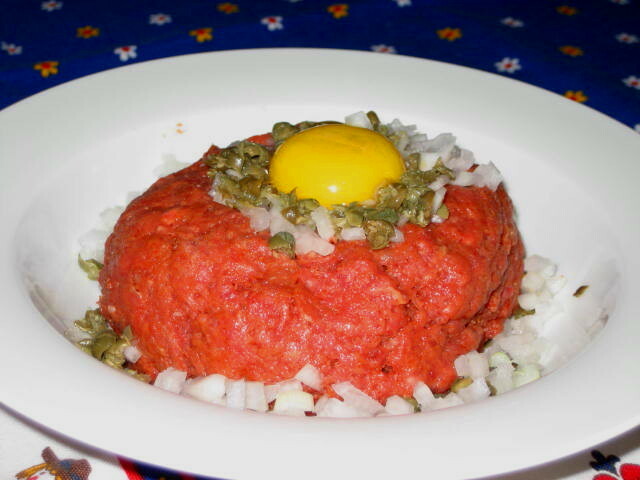 Chefs put months of work into creating a single, non-gross beef tartare dish for their menus. And even then, it sometimes comes out looking wrong. Reminder: You are eating raw cow.